Lynne is a lifetime learner. 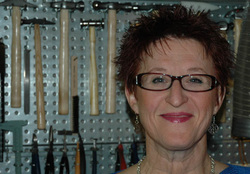 Her 25 year journey in jewelry making has evolved from beading and chainmaille thru metalsmithing and lapidary with recent adventures involving enameling and lampwork. Lynne's repertoire of unique jewelry encompasses darling dainties to bold statement pieces in classic, organic and travel inspired designs. Lynne's obsession is to create unique jewelry for extraordinary individuals..... life is way too short to wear boring jewelry!! !